Homer M. Root arrived in Clark County in 1869 from his home in Guilford, New York. Homer formed a lumber partnership with B.F Thompson in 1874. Over eleven years of operation, their company harvested 55,000,000 feet of Clark County pine timber. In 1888 Homer was elected Clark County clerk, serving in that capacity for eight years. In 1889 he moved to Neillsville. Homer Root opened a private bank in Neillsville in 1898. That bank evolved into the Commercial State Bank of Neillsville. Homer served as its cashier until 1916 when he became the bank's president. Withee Construction Company began construction of the 30' X 40' house in July of 1922. This Craftsman Bungalow is a sung one-and-one-half- story home containing built in cupboards and cozy nooks. 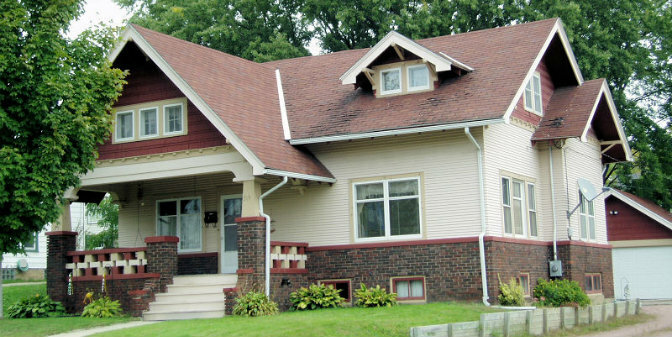 The 1922 home exhibits a low-pitched gable roof with triangular knee braced bracketed gable ends. A prominent exterior chimney pierces the roof A deep porch is located under the main gable. The overhanging second floor gable is supported on heavy wood posts, which rest on brick pedestals. Cement block is decoratively arranged to enclose the porch. Several courses of brick are topped with a limestone sill, which ex-tend around the house. A band of false beam-ends, which also extend around the house, separates the clapboard siding from the shingled gable ends. A wonderful surface of textures is created on each elevation.